I think it’s clear by the action in the dollar index this morning and the response by risk assets in general, that the bottom I have been looking for is here. Today will be the first day in a commodity rally that should last roughly 2 years topping in mid-to-late 2014 when the dollar puts in its next three year cycle low. The next two or three weeks should produce an exceptionally violent rally from extreme oversold conditions followed by a consolidation period as the dollar bounces weakly out of its intermediate bottom and rolls over quickly signaling that the three year cycle has topped. This entry was posted in Uncategorized on June 29, 2012 by Gary. Sentiment has reached levels similar to the last three year cycle low in 2009. At this point we are just waiting for the oil cycle to bottom. Today is the 51st day of oils intermediate cycle, which generally runs 50-70 days on average. I think oil is going to bottom in the next 3 to 5 days. 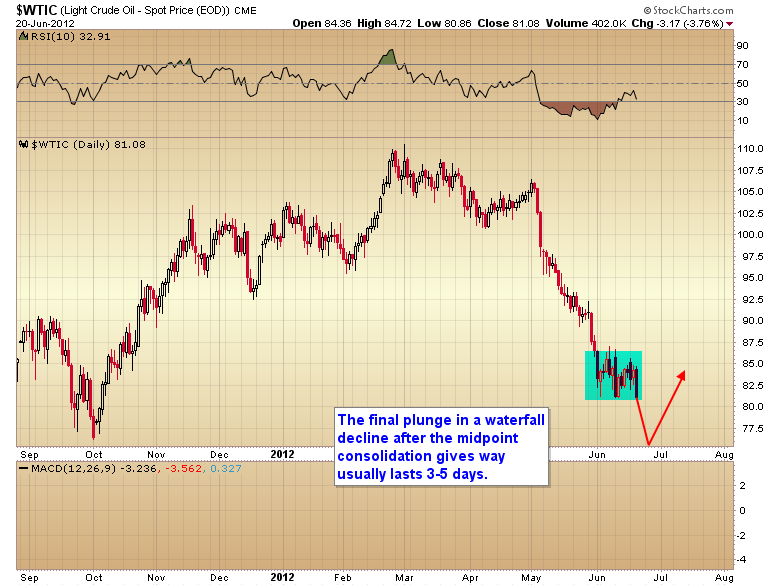 The reason being; oil is in a waterfall decline that has just formed a midpoint consolidation. Once the midpoint consolidation gives way the final plunge usually lasts 3-5 days. This should correspond with a dead cat bounce in the dollar index before it rolls over and heads down into an intermediate bottom sometime in the next 4-8 weeks. During this final plunge it appears gold will move down into a daily cycle low. That low should hold above $1526 as I think gold has already formed its yearly cycle low back in May, slightly ahead of the stock market and the CRB. Sometime in the next few days investors will get the single best buying opportunity to position in commodity markets for the coming inflationary period. I prefer the precious metals (more specifically mining stocks) as they have already indicated they are going to lead this next leg in the commodity bull, but I think investors will generate tremendous returns in almost any area of the commodity sector. One to watch is natural gas. It may be the largest percentage gainer during the next two years as it has gotten beaten up more severely than almost any other commodity. This entry was posted in Uncategorized on June 21, 2012 by Gary. I didn’t really feel like doing a full article, but it was time to do a new post so here is a quick recap of the big picture view which is unfolding pretty much as I expected. The CRB is now in the process of putting in a three year cycle low (this should correspond with a three year cycle top in the dollar) and stocks have put in an intermediate cycle bottom. As I expected gold bottomed slightly ahead of the stock market and stocks. 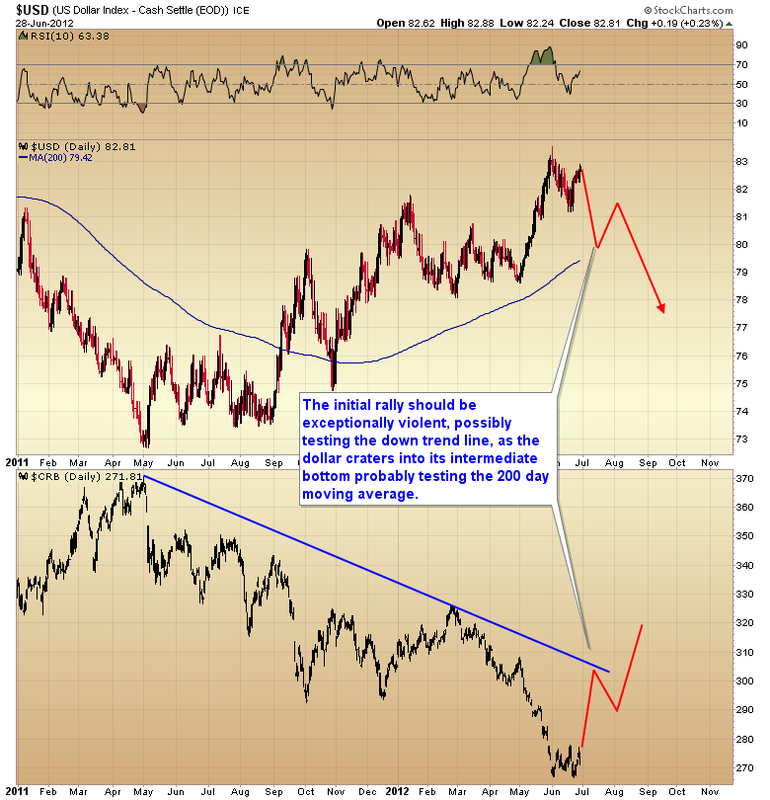 The trend is now up for all assets and all we are waiting on is confirmation that oil has bottomed. Once oil and energy stocks join the party the bull will be firing on all cylinders. The economy will continue to respond to Keynesian economic policies until commodity prices surge into a final parabolic advance and prick the bubble. However that isn’t due until sometime in late 2014 when the dollar forms its next three year cycle low, so I think the perma bears are just kidding themselves if they think the US is ready to rollover into a recession right now. The recent stock market decline was just a normal intermediate cycle correction in an ongoing bull market. Yes it was rather severe, but this was just a normal regression to the mean event triggered by an extreme stretch above the 200 day moving average that was generated by the European LTRO and Operation Twist. I expect stocks will continue to grind higher this year and start to stagnate next year as commodity prices began to pressure profit margins. By early 2013 the stock market should begin rolling over into what I expect will be a very drawn out, and volatile bear market as deteriorating fundamentals do battle with ever greater liquidity injections. This is the prescription for multiple violent bear market rallies in what I expect will be a very long agonizing grind lower as commodity prices gradually pick up momentum and move into the final parabolic spike in 2014. Gold has started a new C-wave advance that should at least test the $1900 level sometime this fall. Don’t expect a breakout to new highs until next spring at the earliest though. Gold may enter the final bubble phase of the bull market in late 2013 & 2014, although I think a more realistic scenario would be that this just evolves into another garden-variety C-wave, topping around $3500-$4000 in late 2014 or early 2015 followed by a severe correction into the eight year cycle low in 2016 and a vicious rebound and final bubble phase of the gold bull in 2017-2018. This entry was posted in Uncategorized on June 19, 2012 by Gary. A intraday post has been published on the website. This entry was posted in Uncategorized on June 6, 2012 by Gary. The following is a reproduction of the weekend report. With Friday’s employment report a few things began to clear up. The first one is the correct cycle count on the stock market. With the break to new lows it’s now apparent that April 10th formed either a very stretched, or very short daily cycle. I tend to lean towards the very short cycle interpretation based on the the trend line breaks I have illustrated in the chart below. But one could make the case for one very long, extremely stretched, daily cycle driven by LTRO and operation twist. No matter how you interpret the last two daily cycles it’s now apparent with the break to new lows that April 10th did in fact form a daily cycle bottom. That puts the current daily cycle on day 37 and now deep in the timing band for a daily (30-40 days) and intermediate (20-25 weeks) degree low. As the intermediate cycle is now on week 34 it’s apparent just how far LTRO and Operation Twist stretched the stock market cycle. I suspect sometime next week we are going to see a narrow range day and a large buying on weakness data print on the SPY ETF. Then once a swing forms it should mark the bottom of this intermediate cycle. I have mentioned before how news mysteriously seems to coalesce around intermediate turning points. I suspect this time it’s going to be another round of quantitative easing by the Fed (although it won’t be called QE) or a gigantic LTRO in Europe to bail out Spain and Italy, or a combination of both. Either way it’s now late enough in this daily cycle that we should expect a bottom very soon (probably early next week). The fact that this intermediate cycle has stretched extremely long raises the odds massively that the next daily cycle bottom is also going to be an intermediate and yearly cycle bottom. Once we have printed the intermediate low we should see stocks rally back to at least test the highs. If the market becomes convinced the next round of money printing is on the way then this could be an explosive rally as traders have now been conditioned to expect QE to drive big market rallies. In the chart below, the first scenario is the most likely in my opinion and would be what I would expect to happen if more QE is introduced. The second scenario would play out if inflation surges high enough and quickly enough to topple the already weak global economy. In that scenario the stock market would move to marginal new highs, allowing smart money to offload positions to dumb money buying into the breakout. What would follow would almost certainly be a 1 1/2 to 2 1/2 year grinding bear market as the slowly deteriorating fundamentals fight ever larger infusions of liquidity from global central banks. Unfortunately liquidity is exactly what would be driving commodity inflation so central banks would actually be making the problem worse rather than better. That being said stocks, especially tech stocks led the last intermediate cycle. I doubt hot money is going to jump back into that sector again right off the bat. No, I expect the stock market will rally fairly quickly back to the old highs but then run into a brick wall that will require considerable consolidation before any serious breakout. An intermediate bottom in stocks (and commodities) should also correspond with an intermediate top in the dollar. I suspect the reversal on Fridays employment report is going to mark not only a daily cycle top, but probably an intermediate, and possibly even a three year cycle top on the dollar index. I say this because the CRB is now due to form a major three year cycle low, and I don’t see that cycle low forming until the dollar index has topped. Since this three year cycle has already stretched slightly long it’s unlikely to stretch for another complete intermediate cycle. All that means is that the CRB’s three year cycle should bottom along with the yearly cycle in stocks and gold (which already bottomed slightly early two weeks ago). Once the dollar has topped the CRB will stop falling and begin moving back up, into what I think will be a parabolic spike much bigger than what occurred in 2008. That parabolic top should come sometime in late 2014 as the dollar moves down into its next three year cycle low. Or as was the case with gold in 2011 momentum may carry the parabolic move slightly past the dollars bottom. 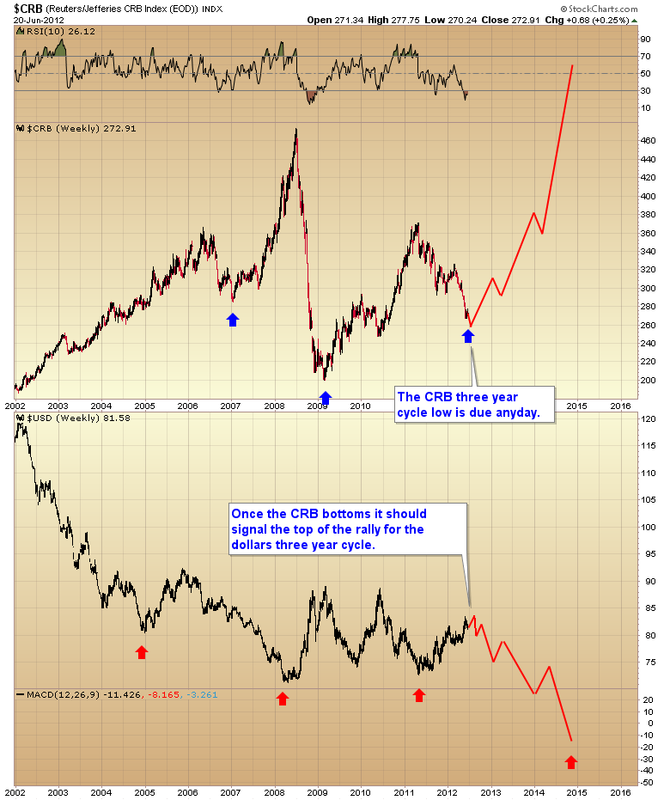 Since the CRB’s three year cycle is already starting to stretch slightly long I am confident that bottom is going to occur right now as gold and stocks all put in their yearly cycle lows. As long as the CRB, gold, and stocks don’t stretch their yearly cycles any further, and I don’t see why they should, then the dollar’s rally out of the three year cycle low is on its last legs. As I mentioned last week sentiment in the dollar index has reached levels not seen in the last 12 years. This is exactly what one would expect to see at a major three year cycle top. So conditions are now in place for major reversals in stocks, commodities, precious metals (already bottomed), and the dollar. I think it’s safe to say that Friday’s action took the short cycle scenario off the table (as well as the D-Wave continuation). Gold not only broke its intermediate trend line, but it also formed a weekly swing. I think we have all the confirmation we need at this point to conclude that gold’s intermediate cycle bottomed two weeks ago. As I pointed out in the dollar section above, this should also mark a yearly cycle low and a B-wave bottom in the gold market. I’m about 99% positive Friday’s rally was the kickoff of a brand new C-wave advance. That being said I wouldn’t expect gold to rally straight up to new highs this summer. It may test $1900 during this new intermediate cycle but I think gold is still going to have to consolidate for most of this year before it can breakout to new highs. My best guess is probably next spring before any sustained move above $1900. This means I think the bear market in miners has probably ended. As everything starts to rally out of its yearly cycle low (and the CRB out of its three year cycle low) the biggest gains are going to be made in the sectors hardest hit during this correction. Without a doubt that was mining stocks. At the lows two weeks ago miners had reached levels of undervaluation only seen one other time in history. That was at gold’s eight year cycle low in the fall of 2008. As you can see in the chart below miners rallied over 300% as everything came out of that major bottom in late 2008 and early 2009. I have little doubt we will see something similar this time as the CRB begins moving up out of its three year cycle low and gold begins its next C-wave advance. Hot money is going to start looking for sectors with the potential for big percentage gains. No sector has that kind of potential more than the mining stocks. As a matter of fact I expect the gains in this sector to be absolutely mind blowing over the next 2 1/2 years. 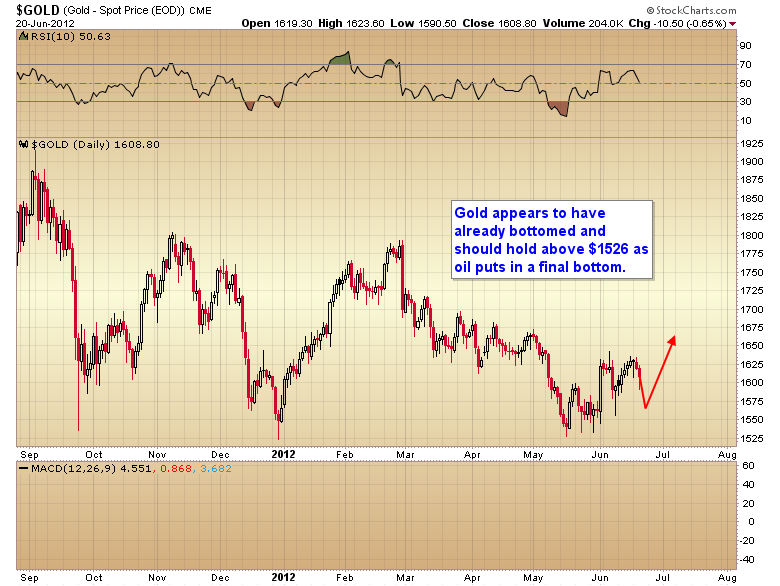 For our purposes all we need to know right now is that gold is on week two of a brand-new intermediate cycle. In those two weeks the HUI has already rallied almost 19% from the trough to yesterday’s close. Keep in mind this occurred while the stock market was still going down and gold was moving sideways. The outperformance in mining stocks is a subtle hint for anyone that cares to take notice, of what is going to lead the market out of this major bottom. It’s the same hint that was given in late 2008 right before miners launched into a 300% rally. If you like the weekend report you can try a $10 trial subscription for the next week. This entry was posted in Uncategorized on June 2, 2012 by Gary.